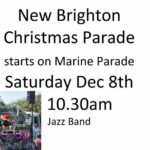 Look out for the Chisnallwood Jazz Band in the New Brighton Seaside Christmas Parade on Saturday 10.30am! New Brighton Seaside Market’s annual Christmas Parade and Concert. -Meet Santa as he arrives by boat on New Brighton Beach at 10.15am.